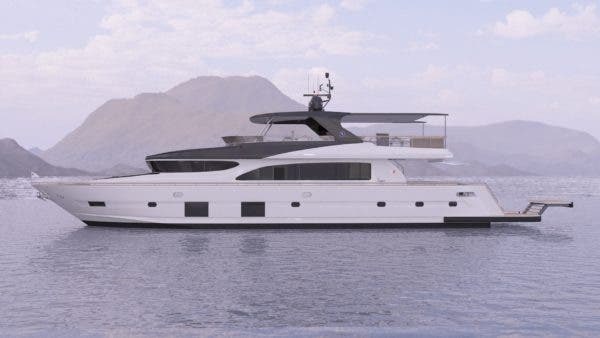 H2-Industries and Nobiskrug, the German boat builder, are collaborating on an all-electric yacht using LOHC (Liquid Organic Hydrogen Carrier), with an expected completion date in the first quarter of 2019. Once finished, the vessel is expected to have a range of 1,000 nautical miles with a cruising speed of 10 knots per hour. H2-Industries CEO and founder Michael Stusch answered some questions about the new yacht for CleanTechnica. What length and weight will the yacht be? 29m (90ft) and 90 tons. Can you explain what LOHC (Liquid Organic Hydrogen Carrier) is? The LOHC technology is based on Liquid Organic Hydrogen Carriers, an oil-like organic substance that binds hydrogen chemically. The LOHC storage tank is loaded with the produced hydrogen and can be stored or transported at ambient temperature and pressure. To recover the energy, the LOHC storage tank is unloaded and the hydrogen, which is once again gaseous, can be used by a fuel cell. How will it be stored onboard? In multiple tanks where one tank is always empty to separate the LOHC+ from the LOHC-. What is the cost of the fuel? The costs depend on the power production to enrich the LOHC with Hydrogen. We burn only hydrogen. This can vary from $0.3 to 0.9 per kWh in USD. How safe is it to store on a yacht? Very safe, it is the only storing technology that can power vessels. The flame point is 200° Celsius, it is not flammable. How many of the vessels will you build? We don’t build vessels, our customers are doing it. The demand is huge, we have orders for over 200 vessels right now. We only deliver the energy technology to the shipyards or owners who are building the vessels. When and where will they be available? The first all-electric yacht will be ready in Q1/2019 and in 2019 we also have the first Inland container ship with our client PortLiner available. How much demand/interest is there in electric-motor yachts with no emissions? 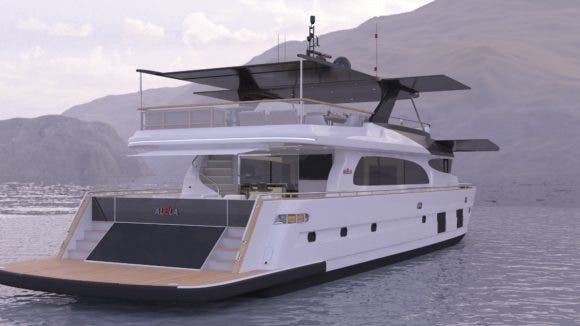 The owners are getting more and more focused on saving our planet, it is only a question of time when everybody will be asking for an emission free motor yacht. Who is most interested in them? Everybody who wants to reduce the total cost of ownership and wants to reduce CO2 emissions. Will the vessel have solar panels? Yes, and the heat which we will get during the storage process will be used for heating the water. For bigger vessels we can use the heat also for producing coolant over an absorption chiller and for salt water desalination. Will it have a battery system for backup electricity or a gas-powered generator? We always have batteries integrated in our energy systems, to release the power in milliseconds and start up our LOHC storage devices. An additional backup is not needed, because in our system, which has an installed power of n times 33kW units (based on the vessel size), we also have n times redundancy which makes backup generators unnecessary. So, does the technology generate electricity, how does it do it, and how much can it generate? The technology is storing energy. Electrical energy from renewable sources is converted into hydrogen which is chemically bound in LOHC. The hydrogen rich LOHC+ can be stored at ambient conditions for unlimited time and also be transported like normal fuel. If energy is needed again, the hydrogen is released from the LOHC+ and converted by a fuel cell to electrical energy. Are the yacht builders then using electric motors? The yachts are powered by electrical motors — in most cases with gearless torque motors. This results in less moving parts with less noise, vibration, and maintenance. How many motors will a yacht have, two to replace the typical diesel engines? For main propulsion, the yachts usually will have two electrical motors powering either shaft lines, azimuthing thrusters, or pods. Does your system use lithium-ion batteries? We are using LiFePO batteries for peak shaving and quick energy supply. The Release Units are running at average load and securing the long-term energy supply. What capacity are the batteries or does it vary by the size of yacht? The size of battery capacity varies depending on the electrical load balance and the operational profile. 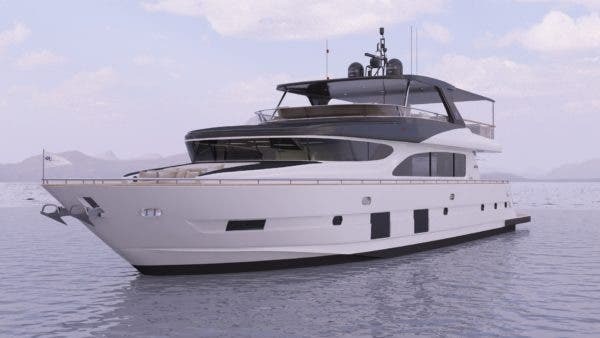 A 30m motor yacht will have a battery storage of 500–1,000 kWh and an LOHC Storage of 10,000–20,000 kWh. Where will the yacht owners get the hydrogen? They will get LOHC+ delivered to the marina in normal trucks or per tank container.